Microsoft Office Specialist (MOS) certification is the leading IT certification in the world. Demonstrate you have the knowledge, skills, and abilities to productively use Microsoft Office. MOS enables you to tap the full features and functionality of the Microsoft Office system, resulting in heightened levels of individual performance, confidence, and differentiation. Microsoft Office training from Global Information Technology is enhanced by engaging the student in real work – life situations, and we see the results on our student’s faces every day. It’s in the confidence that comes from learning, knowing and applying. 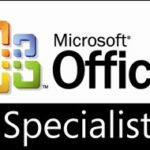 Get certified in Microsoft Office (MOS), as an Office Specialist today. Call 248-557-2480 for more information. More than 1 million MOS exams are taken every year in over 140 countries. In workforce development, MOS prepares and places job candidates, ensuring they possess the skills employers require.